Choose the word that fits in the sentences. Over the next 20 years, up to a quarter of the world’s trees and other plants could 1. been/be lost for ever. 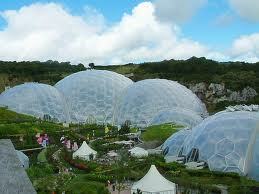 But not if one of the most exciting conservation 2. projects/project, the Eden Project, has anything to do with it. A disused china clay pit in Cornwall, south-west England, is home to the project, the 3. vision/sight of Tim Smit. Eden 4. says/tells the fascinating story of mankind’s relationship with plants. Its futuristic greenhouses or biomes, which are the largest in the world, 5. recognise/recreate the world’s different climates. The project 6. house/houses more than 10,000 species of trees and plants. Its aim is to promote their 7. responsibility/responsible and sustainable management. In the Humid Tropics Biome are plants from the Amazon, Africa and Malaysia, while the smaller Temperate Biome 8. contains/connects plants to enjoy a Mediterranean climate. Outside, on the terraces are plants that have 9. played/worked an important role in human development, such as wheat and sunflowers. Hello there, just became aware of your blog through Google, and found that it’s truly informative. I’ll be grateful if you continue this in future. A lot of people will benefit from your writing. Cheers!